Wear it for Christmas. Wear it for New Year's. But just make sure you try plaid pants before the end of 2017. New Year's Eve outfits tend to fall into three camps: Gatsby formal, staying-in lazy, and "party like it's [insert current year]" vibes. 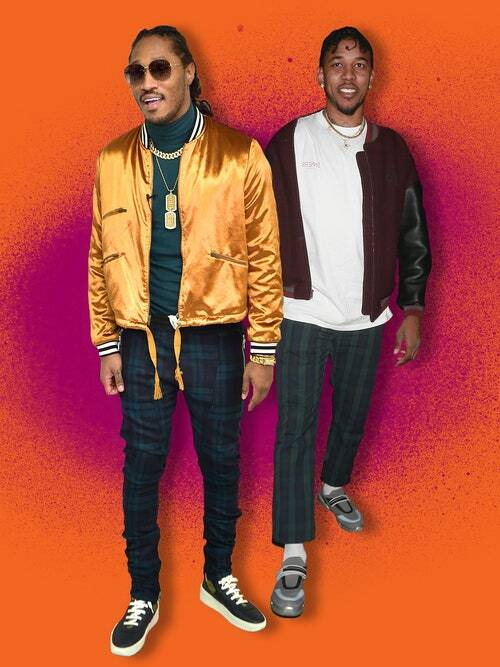 If your plans will leave you in the latter group, allow Nick Young and Future to show you what to wear this year: a statement bomber jacket and plaid pants. Both guys hit the town in the combo last weekend, looking festive, relaxed, and totally of the moment. Bomber jackets have been the trend designers and style-inclined guys won't give up and bold colors and fabrications are the way to do it in 2017. Future's gold satin jacket is on the flashy end of the spectrum, while Young's oversized burgundy option is a lower-key flex. As for the plaid pants, they too saw a huge spike in popularity this year, as the trousers-and-sneakers look gained momentum. Black Watch plaid lends any look a little bit of Johnny Rotten flavor; with a sporty bomber jacket it's the perfect mix of jock and punk sensibilities. Throw on the sneakers of your choice and you've got a party fit that doubles as a time capsule of the year in style. New Year's Eve photos are the best sort of photos to look back on, remember, and that's doubly true when you're wearing the modern-day equivalent of a ruffled tuxedo shirt (in the best way!). GQ readers, we're guessing you already own at least one of these two items, but if not, there are plenty of ways to go about making Nick Young and Future's look yours between now and December 31st. Here's a stylish option for every trend-aware guy out there, from grail shopper to bargain hunter. Just do us a favor and please don't top the look off with a glitter beard. That's one trend you won't be able to just shake off when the clock strikes midnight—figuratively and literally.